“I’m a Self-PublishingFailure” so says author John Winters in his eponymously entitled article on Salon.com. Winter’s piece covers the aspirations, dreams, fantasies, and crashing realities of his self-publishing experience. Case in point: Books Winters sold—zero. Books Winters has given away—1000. Feeling a sense of camaraderie with Mr. Winters, I posted the link to the article on my personal Facebook page. My writerly FB friends chimed in. Aspiring to fail and calling it funny? I decided to read the article again. And this time, I saw it. It was funny, in that poking-fun-at yourself way, as Kirsten said. Case in point: When I self-published for the first time ten years ago, I knew, as one would expect, nothing about publishing. So, I produced a book that was poorly copyedited and had a cover that made me feel the same way as when I was in fourth grade and my mother convinced me to buy and wear this red and white-checkered skirt and top. Affectionately entitled The Pizza Hut Dress by my classmates, my feeling when I wore it was train-wreckingly embarrassed. But I had promised my mother I would wear it, and a daughter’s guilt is as looming and large as a mother’s. 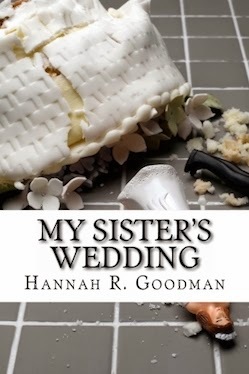 As time went on, and I self-published a few more times, learning more about effective covers and copyediting necessities, I continued to keep My Sister’s Wedding on the shelves of online and live bookstores. It was like wearing the Pizza Hut dress for 10 years. The analogy isn’t perfect, but you get the idea, I continued to keep this book out there, despite my embarrassment. Oh, and by the way, did I mention this very same book I had some shame issues about won the first place award in the Writer's Digest Self Publishing Book Awards, Children's Book division? So, I have republished My Sister’s Wedding, and while it isn’t perfect, it is (and looks) a whole lot better. My writing has evolved and changed, so it was a little rough on my eyes to reread the manuscript, and now that I’m an editor, really hard not to ripe it apart and completely rewrite it. But it is better and, more importantly, it’s not wearing a bad, tablecloth-inspired dress anymore. So, check out My Sister’s Wedding, the ten-year anniversary edition, and because I clearly have no shame anymore, take a look below at the old cover. . . and then the new.